If you're interested in Twitter, what it's all about and how it's effecting the way people interact online, a video called Phantom Limb explores the phenomenon and how it benefits people's lives. It's definitely one Web 2.0 (damn, I hate using that buzz word) thing that seems to have stuck. 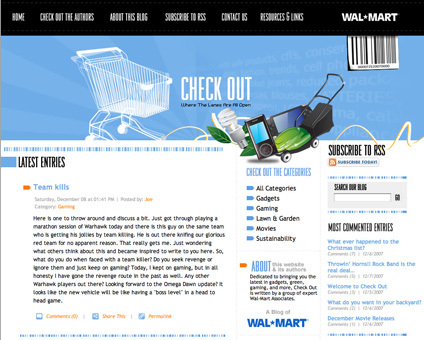 - Walmart's doing the blog thing again. Hopefully they'll get it right this time. - PETA might not like this crazy road kill lady but we do. Except for those nasty teeth of hers. - Cynopsis Digital reports, "NBC Universal added another platform for its download-to-own content - SanDisk's flash memory aided Fanfare service scheduled to launch in January. Fanfare is yet another PC to TV device that simplifies the transfer of content by allowing video to be downloaded to a USB drive then walked over to the TV." - OMMA has announced its 2007 Agency of the Year Awards and has crowned Mediaedge:cia's MEC Interaction top honors. If you don't think we're in a bubble reminiscent of 1999-2001, take a look at this video. It's amazing what a bit of time crunched historical retrospective will do to one's perspective on that topic. It's pretty amazing what's happened in the last two to three years. This video captures it and more. Give it a look and then let us now whether or not you think we're in a bubble and if you think it's about to pop. Comment here or over on AdGabber where the video is hosted. Be sure to check out the similarly styled video on the last two years worth of viral videos.